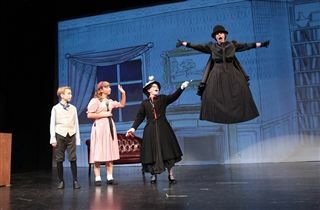 Congratulations to the cast and crew of Mary Poppins, Jr. on a great production last weekend. Thanks to some fancy flying effects, our young actors were able to float and soar through the air in this high-flying production! Thanks to director Trudy Wheeler and technical director Mo Stucker for their hard work on the show. The actors and tech crew should be proud of putting on a wonderful production. All three shows were in front of a packed house!